I hope you all had a terrific weekend. It was a great one for me as I was able to set aside time to stamp on both Saturday and Sunday! Nice! This card was made to order for a friend of mine. 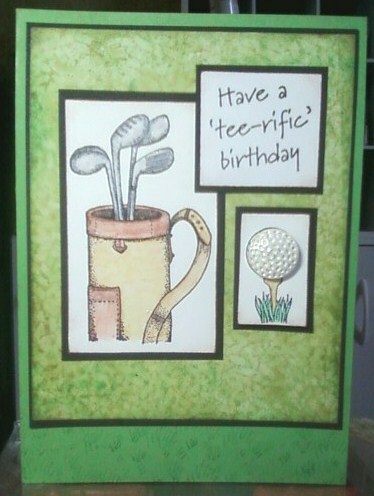 Her son-in-law is a golf lover so I am hoping he will like this golf themed birthday card. The unique aspect of this card is the use of a bead for the golf ball. I painted a flat, round, pitted bead with white crafters ink and then glued it in place of the stamped golf ball to produce a 3d effect. Pretty cool, right!?! Re-defining the use of craft products can be a great way to add flair to your cards and projects. Hope the week goes well for you. Happy Stamping L.